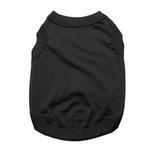 Our Barking Basics!® Dog Tank Shirt in Black is the perfect shirt for almost any pet for an exceptional value! This Barking Basics!® Dog Tank Shirt in Black is sure to be your dog's favorite with a comfortable fit and 100% cotton breathable fabric. Great on its own or use this tank year round by layering it under coats and sweaters to help keep shedding down and for extra warmth. We love our Barking Basics! Tank shirts for group photos (with every dog getting their own color.) Mix and match with our entire Barking Basics line for quality at a price you won't find anywhere! This classic black shirt is a great choice for Halloween, motorcycle events, or anything your pup wants to look a bit edgy. For even more fun, add iron-on patches, embroidery, or screen printing to commemorate any occasion. Have the dog help your event be even more special by designing these tanks for graduation parties, birthdays, family reunions, or sporting events. You could also customize these for a charity or pet event. The sky is the limit! Barking Basics Dog Tank Shirt - Black Customer Photos - Send us your photo! Ready feeling so READY for the morning in his new black muscle-tank!!! Dozer is our gorgeous rescue boy who sustained scald burnsall over his torso. The burns have healed up but he has thin delicate newly healed skin there. These tank tops are great to protect his newly healed skin, And in the black ones that match his fur, he just looks like a normal dog. We personalized our basic black tee with London's favorite hashtag. Everyone loves when she wears her Outfit of the Day! My 2 westies always love getting new clothes, they see me opening up the package and they keep jumping up on my legs until I put it on them then they take off running around playing chase it is so funny!! Rex is a Border Collie & Blue Healer mix. He's going to be 15 years old this June and he's a "Momma's" boy. He's the most loyal, love able and protective little man, I have ever had! I bought this tank for Henry because he had surgery on his left shoulder and the staples were driving him crazy. The soft material has soothed him and kept him from scratching or biting his stitches-plus he looks awesome! Posted On 02/23/19 by Rosa L from Abita Springs, LA Yes, Rosa L recommends this product! Bought for my hairless Chinese Crested to layer under fleece, and extremely happy with my purchase!! Cotton, high quality. Liked so much that I purchased 4 more! Posted On 02/14/19 by Ohatchee from Ohatchee, AL Yes, Ohatchee recommends this product! I ordered this item in several colors for my Italian Greyhound. The shirt is great for bedtime and keeping her warm in the house in the early morning. It is also the perfect piece for layering under sweaters and long sleeve shirts. I recommend this for any pup who is a bit chilly. Posted On 09/12/18 by J P from , WI Yes, J P recommends this product! My 9 lb. 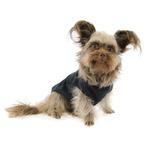 Yorkie Mix looks adorable in this size M tee. She loves wearing it. I love the products from Baxter Boo. Maxim wears doggy clothes regularly. These tanks make his wardrobe collection vast as they are wonderfully cute in every color and they're so easy to put on. Even more they wash well. Stock up on these you won't regret it! Posted On 04/06/18 by FuzzyRev from Olathe, KS Yes, FuzzyRev recommends this product! I have two Miniature Schnauzers that came to me from breeding farms and they have anxiety issues. This (and the other colours too) tank top provides lightweight coverage and mild compression for everyday activities when a full Thundershirt is not wanted or needed. They fit Miniature Schnauzers well, which is not easy. They wash up beautifully. Perfect! Posted On 03/03/18 by Leanne T from , MA Yes, Leanne T recommends this product! Love all these T’s! So cute on my Frenchie. It is a nice tank top. Bought it for my 85 pound Doberman, female. Bought the 3X because I matched her size up on the chart posted on the web site and it was too big for her. It did shrink when I put it in the dryer (they say lay flat to dry) but not enough so I ordered the 2X and once that one shrinks it will fit good. Posted On 02/01/18 by Bernedette A from , NY Yes, Bernedette A recommends this product! Just got it today. I have an 85 pound doberman and followed the measuring chart so I ordered her a 3X. I went mostly by the chest measurment which was only an inch smaller than the chart and it is much too big for her. I really like the shirt so I ordered her two more in the 2X size hoping they will fit better. My boys look so tough in these tanks, two little boys love it. good quality, and true to size, nice basic shirt! Posted On 05/29/17 by Shelia M from , Yes, Shelia M recommends this product! Love this shirt! Fits perfectly!! Posted On 05/15/17 by Barry W from Salem, KY Yes, Barry W recommends this product! Posted On 04/21/17 by Susan M from Farmingville, NY Yes, Susan M recommends this product! It fits my german shepherd perfectly! Very soft and he seems to love it. Posted On 04/17/17 by charylene st clair from Morgantown, WV Yes, charylene st clair recommends this product! Fits good and looks good great for having some type of lettering put on it. Posted On 04/16/17 by Clair S from Columbus, OH Yes, Clair S recommends this product! Have ordered this 100% cotton shirt before. Light weight and helps protect skin of my little Bichon. Posted On 04/04/17 by Kim W from Dayton, OH Yes, Kim W recommends this product! Our boxer loves wearing his shirts!!!! Posted On 03/18/17 by Rebecca W from Clio, MI Yes, Rebecca W recommends this product! Love that there's actually black to choose from! Easy to personalize. I ordered this for my dog to go on a trip in our car. He sheds a lot and I thought with this shirt on it would keep down the amount of hair he sheds. Posted On 03/08/17 by LisaDawn M from Olathe, KS Yes, LisaDawn M recommends this product! This is a superb all cotton tank top. No sleeves to cause underarm matts and it fits nicely, giving my allergic baby a bit of a figure. She doesn't itch now and she looks good too. Double win. It's hard to fit chunky Miniature Schnauzers. This shirt in size Large was perfect. Every puppy needs at least one great black tank! Quality Fabric! Vibrant Colors! Good Fit! Comfy and Soft! 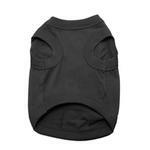 all dogs need a little black top! Posted On 12/07/16 by ANNE F from BRIDGEWATER, MA Yes, ANNE F recommends this product! PERFECT FIT. MY BICHON LOOKS GREAT IN IT PLUS HE'S WARM. Posted On 12/06/16 by Karyn H from Houston, TX Yes, Karyn H recommends this product! Ordering from BaxterBoo was fast and easy. There is so much variety, and it was easy to find exactly what I wanted. Prices are great, and delivery was quick too! I had to return one of my items due to size being a little too small, but the return process was simple, and my replacement item is already on the way. I will definitely come back to BaxterBoo for my future orders. Posted On 11/22/16 by Ana B from , FL Yes, Ana B recommends this product! Posted On 11/18/16 by Wear it Pink! from , MI Yes, Wear it Pink! recommends this product! I am not sure how many of these shirts I bought for my pup's wardrobe is getting bigger. I just love them! I apply different iron-on/rhinestone transfers, this time a pink ribbon for Breast Cancer awareness. :-) I will definitely come back for more! Posted On 11/17/16 by Susan G from West Lawn, PA Yes, Susan G recommends this product! We bought four of these for next Halloween as the length and fit are great for multiple uses. It works well for my girl dog as a shirt with her tutus and my boy for protective coverage when playing in the yard. I love love love this tank top! I also ordered it in Blue. This is great for fall as it helps with my dogs skin allergies since grass seems to bother him and also helps keep him clean on walks. I ordered an xl and it fits just right. I just placed another order in different colors! I accidentally ordered a large instead of an XL. But did like the fabric. Posted On 09/27/16 by Diane J from Hillsborough, NJ Yes, Diane J recommends this product! I wanted this one so I can decorate it the way I want to. Whether for a holiday or Halloween. I like to keep the heat down and this helps Jack stay warm. When I want my Yorkie to dress a bit more formal, I go to the black dog tank. She has mostly gray fur in the winter and the black is a great contrast to her fur. She looks so cute! Great basic black tee for layering or wearing alone. It fits easily under a sweater or harness. Posted On 09/16/16 by Amanda G from PIke, NH Yes, Amanda G recommends this product! Although the two I purchased were a bit smaller than expected, the quality was amazing. I have already placed an order for a size up and I'm sure with the right fit, I will be 100% satisfied. Posted On 09/12/16 by karen s from OKAWVILLE, IL Yes, karen s recommends this product! This tee was exactly what I was looking for, and the price made it perfect. The fit was perfect and quality was great. I added a tutu at the bottom for a halloween costume, and everyone cannot believe how it turned out. I will be ordering more in additional colors. Nice looking shirts. Nice material for the heat. They are made nicely. Easy on and off shirt. Nice to have a throw on shirt. Keeps my pooch from digging and itching her back. Posted On 09/03/16 by julia c from Bella Coola, Yes, julia c recommends this product! This is a nice rich black colour will go with most any thing, nice material. Posted On 08/29/16 by Virginia K from Chicago, IL Yes, Virginia K recommends this product! Quality and fit are perfect! Just bought 4 more in different colosr! Posted On 06/27/16 by Go Green! from , MI Yes, Go Green! recommends this product! This is my pup's 2nd Barking Basics Dog Tank Shirt, and I just love it (so does my pup)! The first one (in orange) I applied Tigers iron-on/rhinestone transfer, and this one Spartans. Love the quality (double stitched) and you can't beat the price! I will be buying more to enhance my pup's wardrobe! Posted On 06/13/16 by RITA S from Converse, LA Yes, RITA S recommends this product! I love these black basic tank shirts, my westies are white so this black tank looks so good on them, they love getting new clothes!! Posted On 06/04/16 by Carlin D from , Yes, Carlin D recommends this product! I'd recommend this shirt 100 times over! Amazing quality. If you get the chance, buy these shirts! Posted On 06/01/16 by VaL from Conifer, CO Yes, VaL recommends this product! I have a tiny Affenpinscher, who wears a Small in everything EXCEPT Barking Basics - their clothes run small so I buy him a medium. Very lightweight and comfortable - great price! Posted On 05/31/16 by Alicia R from , Yes, Alicia R recommends this product! True to size, I really like this shirt. Posted On 05/28/16 by Robin P-D from Pennington, NJ Yes, Robin P-D recommends this product! Posted On 05/27/16 by Lisa D from Beckley, WV Yes, Lisa D recommends this product! I got one of these shirts for each of my dogs. They fit well and the girls kinda love them more than me right now lol. Great shirts all around!!! Posted On 04/22/16 by SUSAN E from New york, NY Yes, SUSAN E recommends this product! Fits well and easy to put on. I got a few colors to mix it up some! Comfy for my little. Only teensy issue is that the neck tends to stretch out a little. NOT a complaint though - love these! Posted On 04/20/16 by Gail M from New York, NY Yes, Gail M recommends this product! Perfect for all occasions, comfortably light and great as layer for warmth. Posted On 03/28/16 by karen c from merced, CA Yes, karen c recommends this product! Shittles loves his new tank. His chest measurement is 22.5 and he got the large which fits a 19 inch chest. I knew it would be a little snug but I also anticipated that the t-shirt material would have enough "give". Luckily I was right because the measurements for the x-large would have been too big. Washes and wears well... but shows shedded hairs on this colour! Posted On 03/04/16 by Melissa S from Plymouth, PA Yes, Melissa S recommends this product! I bought this plain shirt so a friend could screen print a personalized message on it for me. It turned out great. It runs a little on the big side. I have an English Bulldog and he's a little wider than long. The width was great though. I would order this again. Posted On 02/28/16 by Jennifer S from Morristown, TN Yes, Jennifer S recommends this product! Posted On 02/06/16 by Gayle G from Topeka, KS Yes, Gayle G recommends this product! Good quality. Fit great. Kiwi wears daily. Posted On 01/27/16 by Susan L from Kinsman, OH Yes, Susan L recommends this product! Perfect fit, great quality for the price!! Posted On 01/21/16 by Diana C from , TX Yes, Diana C recommends this product! he's a big boy and it fits pretty good except that the neck is a little big and we have to pull it back up sometimes. Posted On 01/15/16 by Ed from Painesville, OH Yes, Ed recommends this product! This is a great little product for your puppy. However, when you go to place your order, you probably need to go to one size larger than what you have measured according to their notes. Posted On 01/12/16 by Sheri P from Pasadena, MD Yes, Sheri P recommends this product! My big boy won't go outside without it on! We purchased this tank top for our grand-dog. He is actually wearing it as I type this review. I have purchased multiple tank tops in various colors and have been happy with each and every one of them. I would recommend this product to others. I bought this for my dog. It was a little big. The sizes run big. I would buy this again. just a size smaller. the sizes for the weight runs big. it's hard to shop for a 85 lb. dog. Hoodies are well made and comfortable. Posted On 12/21/15 by Marnell L from Brighton, CO Yes, Marnell L recommends this product! My male 120 lb Rotti loves wearing his shirt. I love how well it washes. I purchased this shirt in every color I could find in an XXL. Great product, great price. Posted On 12/15/15 by Mary G from , Yes, Mary G recommends this product! Finally a shirt that fits my dog and is good quality! Thank you. I'm buying another one today as the black one has gone missing. Posted On 12/14/15 by Penny S from Waterloo, IA Yes, Penny S recommends this product! These shirts are so cute and soft. I think my Mac loves wearing them in the house to add some warmth. I have ordered a few more but size XXXL so they will fit alittle loose on him. Posted On 12/11/15 by Debbie A from , LA Yes, Debbie A recommends this product! While we had to change for a larger size, it is a great weight and we will have it personalized. Posted On 12/08/15 by Connie L P from Porum, OK Yes, Connie L P recommends this product! These were purchased to go under vests and coats for the winter. They are working great and still add fashion when they strip down to them when we are inside. They come in many colors so they will work under all of their cloths. I have Chi's and they need to be warm. The workmanship of them is great and they cloth weight is perfect. I already had several colors and I am sure to add more. Posted On 10/31/15 by Angie H. from Ider, AL Yes, Angie H. recommends this product! I will be ordering these shirts in every color available for my Buster. The large fits him perfect! I will be a repeat customer! Love! Perfect little lightweight tshirt for our CAT, who needs something post-surgery to keep from licking/gnawing at incision area. We also got the BaxterBoo ribbed tshirt too. This one is lighter weight, so nice for warmer temps. Would recommend these 'dog' shirts for cat-owners to use post-surgery, vs putting a cat through the trauma of wearing the "cone of shame". these barking basics shirts are the best. great quality, inexpensive and great basic colors. love them!!! Posted On 05/24/15 by LB from , NJ Yes, LB recommends this product! Great little tank. Washes well. Posted On 04/10/15 by Robert M from Pueblo, CO Yes, Robert M recommends this product! This is Missy the Yorkie's favorite new shirt. A snug but comfy fit and ideal for cool morning walks. Posted On 04/08/15 by Stephanie R from Monroe, NY Yes, Stephanie R recommends this product! Material is so soft and size is perfect! Posted On 03/20/15 by Ronda P from Lancaster, TX Yes, Ronda P recommends this product! I needed little tshirts for my Maltese when he is having allergy/itching issues and these are great by themselves and as undershirts for his other clothes. Posted On 03/05/15 by Ginger S from Barnett, MO Yes, Ginger S recommends this product! Posted On 03/03/15 by Lisa L from eugene, OR Yes, Lisa L recommends this product! I intended on getting the baxter boo basic tank in a few colors but I accidentally chose this brand for the black one. It was a nice fit and the hems are thicker and wider than the BB basic. The material is traditional t-shirt cotton so it collects hair more than the synthetic material of the BB basic but all in all its a nice alternative. Posted On 03/01/15 by vanessa s from , Yes, vanessa s recommends this product! This tank is adorable and fits perfectly ! Posted On 02/20/15 by Joyce F from Ft. Washington, MD Yes, Joyce F recommends this product! Monty is mighty handsome in his black tank. He never wants to take it off. Posted On 02/17/15 by Judy H from Mpls, MN Yes, Judy H recommends this product! Can not go wrong with this basic Tee. Hard to find anywhere else and the price? an extra bonus. Posted On 02/14/15 by Jen J from Sun City West, AZ Yes, Jen J recommends this product! Great fit, nice fabric, looks terrific against his white fur. Its very comfortable, he doesn't mind slipping it on & wearing it all day. Nice big arm holes make a difference. No problems here. We love all the colors available, sale prices and quick shipping. Posted On 02/13/15 by Janice R from Kerrville, TX Yes, Janice R recommends this product! I really like the "Barking Basics Dog Tanks" that I recently ordered. I like the fabric and the fit. I thought they were going to be to small, until I tried them on my dogs. They are stretchy and fit nicely. I like the large neck and arm holes. They are the perfect style and weight for our Texas winters. Always has a friendly, helpful staff.